Ancient caravan stops in the desert, which today moves to the sound of the sand blowing through the air and the guitars’ insisting sounds of the past. View West Africa on askgudmundsen's travel map. Heading into the Mauritanian Sahara, I had to pass through a few unavoidable cities and towns. The region's central city is a garrison town and administrative centre, and nothing worth talking about. However, there were a few other places. The cities of the Sahara’s caravan trade seems to have one thing in common. They rise out of the Earth, more like growing three than buildings. Or, I could be mistaken, are they being consumed by the sand and rocks they stand on? It’s impossible to tell. Chinguetti, the most famous of Mauritania’s caravan stops (at its height 32,000 camels passed through here every day), seems at one with the sandy dunes that engulfed the ancient city. A hundred kilometres to the northeast, Ouadane’s crumbling houses, mosques and city walls give off the impression that the stones have just tumbled down the mountainside, randomly forming the buildings that now form a ruined ghost town. Regardless, there’s something in the air in these place. Something more than the dust and the sand always blowing in from the desert surrounding them. The whistling sounds sand-grains make as they fly through the air hits at a whiff of history, that simply won’t leave the cities. These cities were not only important for caravans. Medieval Islamic scholars congregated on these towns, as the caravans did not only bring goods and trade. They also brought knowledge. These scholars began to collect manuscripts and books, not only religious texts – Koranic verses and Sharia law – but also history, cosmology, Greek philosophy and Babylonian laws. All this a thousand years ago, when Europe was still caught in the Dark Ages, and people through that the Earth was flat. 400 years before Copernicus figured out that the Earth moves around the Sun (not the other way around) did these Islamic scholars draw Solar-centric illustrations in their books – in the middle of the Sahara. 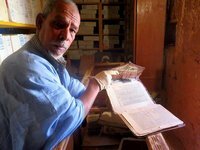 More than 15,000 of these books are still stored in private libraries in the desert cities of Mauritania. History isn’t the only attraction here. Once the scorching sun is setting over the horizon of dunes life, return to these ancient cities. Blankets will be spread in front of peoples' house and the tea will be prepared. An important evening ritual here is to keep one’s friendships alive and well. People will thus make rounds. From house to house, from blanket to blanket. Many friendships go back to peoples' childhoods; some go even further back. Families, who have been close-knit for generations. In these cases, keeping the relationship healthy is not only a matter of social comfort – it is a duty to one’s family, one’s parents and grand-parents that are not taken lightly. Central for knitting the social fabric of Mauritanian social life is two things: tea and music. The only thing that possibly can interrupt these ‘rounds of friendships’ is when the musicians bring out their instruments. Lead by an insisting guitar (these days more likely to be electronic than traditional) men and women alike will gather, spontaneously, around the musicians. Though these a subtle affairs, with most people sitting down, all will join the musicians. All bands will thus have one or two ‘lead clappers’, who will lead the crowd by showing the rhythms of the claps. Often, when there is more than one band clapper, they will clap different rhythms. They are thus equally a part of the group than the guitar, the singer or the drums are. As an attendant, all I have to do is pick one of the clappers and follow his lead. The other central element to Mauritanian life is tea. 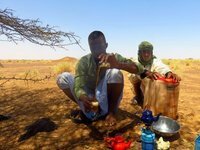 Tea is a cultural ritual in many countries, but in few is it obsessed over as it is in Mauritania. Tea here is not just ‘a cup of tea’. It is the fuel for conversation and as such, it is no small business. Tea will be offered to an arriving guest; by merely passing in front of someone's house; or – in the middle of nowhere – when the taxi-brousse driver needs a break. But make sure you have the time before accepting a tea-offer. Brewing tea correctly in Mauritania takes no less than 40 minutes and easily more than an hour. Two pots and at least three classes are required in an endless ritual of pouring the tea between the pots, between glasses and between glasses and pots the taste of each serving is perfected. Tea here is not one glass, but three. The first strong – this one is for health. The second neither too strong or too sweet – this one is a life without too many extremes. The last glass you get served is very, very sweet – this one is for love. The glasses large shot-glasses and the upper half consist of white foam made in the pouring process. Drinking the tea actually takes a fraction of the time it takes to make it. The mean time is filled with conversation. Mauritania is a conservative country, and it is easy to see in daily life. I found it worth it to slow down and appreciate this in the Sahara towns historic setting. Especially since I was about to head further into the Sahara for something that would be a rather challenging walk. More on that in a few days. If you’ve liked what you’ve read, why not give a ‘like’ to this blog on Facebook? Ask, great observations. Looking forward to your next entries. Bob.